As one of the regular crew on PARADOX, Helena Darvelid reports back after a hard-earned class victory during the 2015 ROLEX FASTNET RACE. 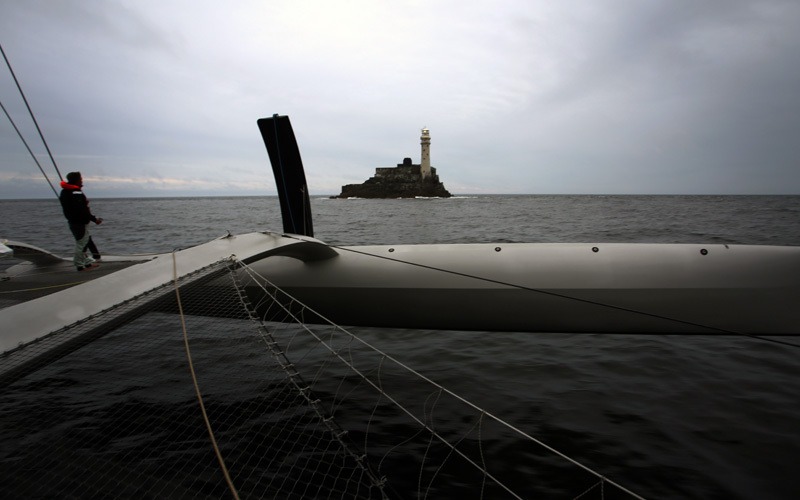 ‘PARADOX’ a 63’ Irens/Cabaret designed trimaran. 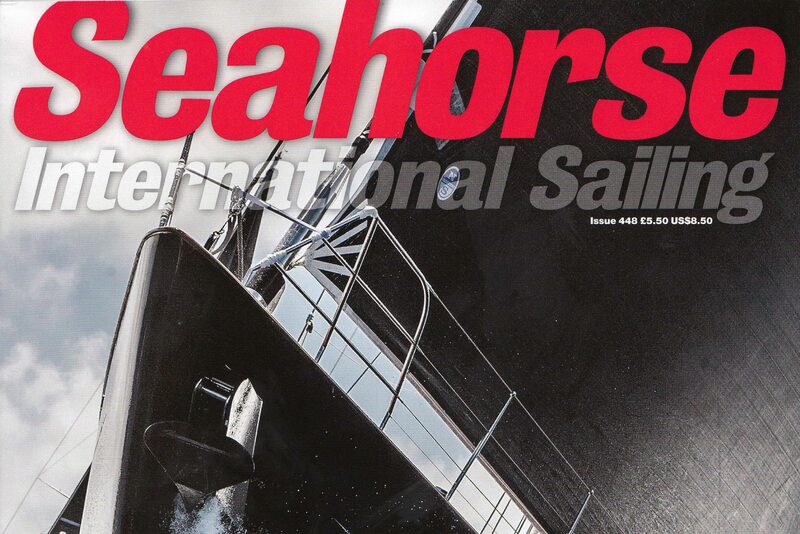 Peter Aschenbrenner, with a total crew of 6 and a combined mileage raced/cruised on this boat of more than 100,000nm. Start: Midday start, pretty much a windless Solent day with a springs outgoing tide for the next 6h.From the start to the Needles we fought an amazing tactical duel with the MOD 70’s and even narrowly ducking the mighty Spindrifts transoms half way out of the Solent. Olivier and I were playing the wind and tide, agreeing between us when one or the other was the king to play. Peter and the rest of the crew used the boats momentum and powered winches to make the tacks as smooth as possible in the light wind. At the Needles we did our final tack and we had managed to still stay ahead of all but SPINDRIFT and PHAEDO but as the wind increased we began to slip behind. As we tacked out of the Solent and was settling in to a watch system the Code 0 gave up the ghost and ripped horizontally from the luff, we had to furl quickly and unfurl the solent, the code 0 was put away in the fore peak (for now). As the sun was setting we had MOMO close to us and a couple of Imoca 60’s in sight to leeward. We were on a course heading for the NW corner of the Casquets TSS, hoping the wind would lift us around it. We just made the TSS (Traffic Separation System) as it got dark, the boats up ahead were sailing in a lifting breeze and were slowly starting to head more towards the Land’s End peninsula. We followed on this course as the wind got lighter and lighter. At Land’s End we found ourselves amongst most of the front runners of the IMOCA’s, Volvo 70 and SCA Volvo65. As we ghosted along behind BANQUE POPULAIRE, we knew we needed the Code 0. We decided we had to dig its torn remains from down below to see if a resurrection was possible. We hoisted and unfurled it. It was far worse then what I remembered. It really was toast…Yish! But hey, it was still pulling …let’s just sail with it until she breaks completely? Peter came on deck, he went forward to inspect it and came to the same conclusion, “we need it, let’s try to put a patch on it and sail to a TWS limit of 10-11kn and she might last through this light patch”. We hung with the 60’s to the corner of the Lizard. Decision time… North of the TSS or South of the TSS? That is the question. After a very quick session of more calc’s and weather study we decided South, mainly based on the wind we had right there and then (a light North) hoping for it to hold to get out on the North side of the Scillies and then into the new breeze that was coming from the SW. Olivier was waving good bye to the rest of the fleet. If we were one design our decision would have been easier. Now we have to sail well through this light patch, not to get stuck in a foul tide ripping through the Island. 10h! 15nm! Yish…we sat and watched the little light on the NW corner of the Scilly Islands from dusk until dawn. Man it was painful we even went backwards at one stage, discussing anchoring or sailing with the tide all the way around the South side of the Island. Instead we got the ol’ faithful ‘0’up and pointed PARADOX in a Northerly direction and started to sail with some apparent wind. The wind kept lifting us, we needed to tack but could not in the light breeze and flicking the top batten of the mainsail would be almost impossible without hoisting Gael up the rig. The heading looked so unbearable we had to tack but decided to do a granny tack (Gybe) that worked a treat. Now almost dead on course and the SW wind that was predicted was starting to fill in. The boats up North were also beginning to accelerate. Still equipped with our patched up code 0, we were trucking along waiting for it to let go with 15 knots of TWS. With bright blue skies and sunshine, a new race to the Fastnet Rock had begun. Wind was increasing so we furled and put up our number 2 gennaker. We sheeted it inboard and put the curved foil down. Paradox was sitting on 22-24kn of BS, bang on course. Approaching the Fastnet the grey mist was settling in and the cloud coverage got lower a persistent drizzle started that would stay with us all the way home. We rounded the rock around 20.00h ahead of the IMOCA’s and Volvo boats so we were pleased our route had paid off. The wind was increasing almost on cue from a 200deg direction to a 22-24kn strength. We stayed ahead of the front and never saw the westerly shift starting for the rest of the night. From here on in, these perfect winds took us all the way to the finish line. Smoking along in the dark doing 25-28kn and at times 30-33kn, we saw the wind gusting up to 28kn and took 1 reef, more for human comfort then being overpowered. The helms had the driving rain hitting their eyeballs like needles. The furious ride back from the Fastnet pretty much put us back in the race and as we found out later got us a win on handicap in the MOCRA class. The 256 nm distance for that leg was the fastest out of the entire Fastnet fleet(See below timings). This was one of the best Fastnets I have done, it basically had everything in it, no wind, good competition, big tactical options, lots of wind, great boat and a brilliant crew. The stories in the beer tent afterwards were so enjoyable, everyone had a different story to tell. I think our win was a popular one.